Synflex for Pets is a liquid glucosamine formula for arthritis in pets. Most Glucosamine products on the market today come in pill or capsule form which is not absorbed well by the body of pets or humans. 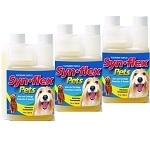 Synflex For Pets on the other hand, uses pharmaceutical quality liquid Glucosamine Sulfate and Glucosamine HCL for a full 80%-85% absorption rate giving maximum bioavailability and quicker relief. When using pill or tablet form glucosamine, it can take six to ten weeks before a positive result can be obtained, however with Liquid Glucosamine Formula Synflex for Pets most of our customers report noticing significant pain relief in just a matter of ten to fourteen days, sometimes sooner. Synflex for Pets has been reported to show significant improvement within 20-25 days even in the most severe cases of osteoarthritis. Even better, Synflex for pets has no serious side effects unlike Rimadyl, Deramaxx, Previcox and Metacam and other prescription products for osteoarthritis for pets. Recently, FDA released information concerning non-steroidal anti-inflammatory drugs for pets - including Metacam, Deramaxx, Previcox and Rimadyl - that shows they have been connected to 22 000 cases of illness in dogs. According to some veterinarian there can be liver issues, kidney issues and gastrointestinal irritation as well. Pet owners do not have to turn to potentially harmful prescription drugs for their pets health. 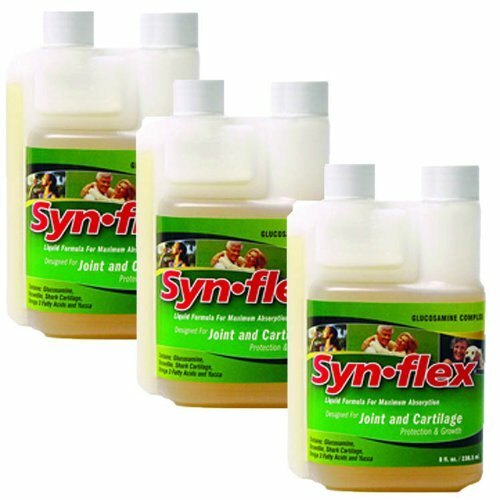 While similar products contain only Glucosamine, or at most three or four ingredients, there are eleven ingredients in Synflex, all working synergistically to effectively manage osteoarthritis, aid in rehabilitating damaged cartilage, promote healthy joints, and reduce inflammation. The Pet Formula of Synflex contains the highest possible quality liquid Glucosamine Sulfate and HCL, 20% chondroitin sulfate, boswellin, yucca powder, manganese ascorbate, bromelain, vitamin C, omega 3 and omega 6 essential fatty acids,vitamin E, and vitamin A. We will go into detail on exactly what each of these ingredients offer and how they work together a little later. The special Synflex for Pets formula combines the latest advances in liquid Glucosamine ingredients into one product that can significantly reduce arthritis pain and effectively promote joint health. Instead of hard-to-absorb powdered Glucosamine in pills, Synflex is formulated in a liquid for maximum Glucosamine absorption and pain relief. "Our patient is a 40 lb. 24 year old cocker spaniel. Before Synflex, she was on Rimadyl 75mg once a day for arthritis. Limping and scared to go down or come up stairs only two or three steps to negotiate. After Syn-flex for about 4-5 days, she would bound down the two or three steps simply by hand signals, she's deaf. My wife and I both noticed the improvement. I just bought two more bottles of Synflex for her."